Even though I live near Kansas City, it is still difficult to find local sources of wool roving, spinning equipment, and fiber classes. There are several yarn shops and chain hobby stores that carry a wide variety of ready-made yarns, but there are very, very few places to find actual wool roving and spinning supplies as well as classes. 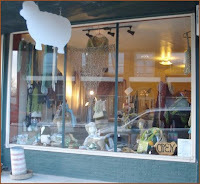 On facebook the other day, I happened upon just such a shop in Lexington, Missouri, called Woolgathering. My husband was very sweet to take me and the baby girl for a little Saturday afternoon drive to check it out. I was extremely happy with what I found. It is an awesome fiber shop! The shop carries all kinds of fiber arts supplies and equipment and even offers classes on spinning, knitting, and crochet. It also has very reasonable prices. I left there with a bag full of roving and know that I'll be back for more. Also, Lexington is really a sweet little town with oodles of charm. I could see making a day trip of it to explore the downtown area and eat there. (Although, it isn't too far for a quick trip for supplies either.) When you get the chance, I highly recommend that you go check out Woolgathering for yourself. If you are a fiber artist or fiber junkie of any kind local to the Kansas City area, I think it is well worth your drive time.